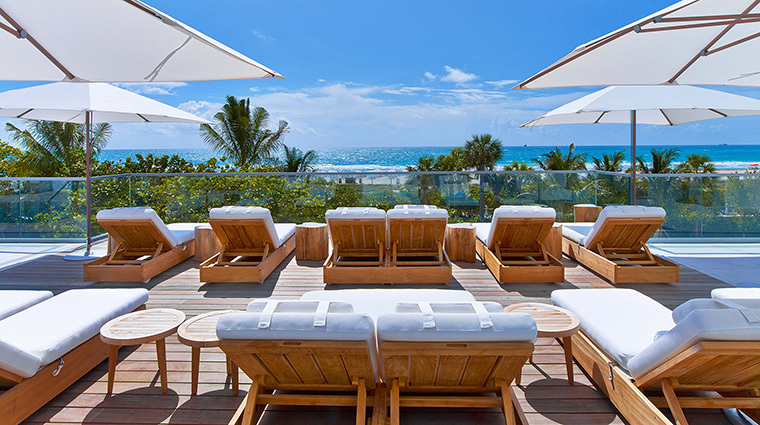 1 Hotel South Beach was developed with the philosophy that those who travel the world also care about its well-being. 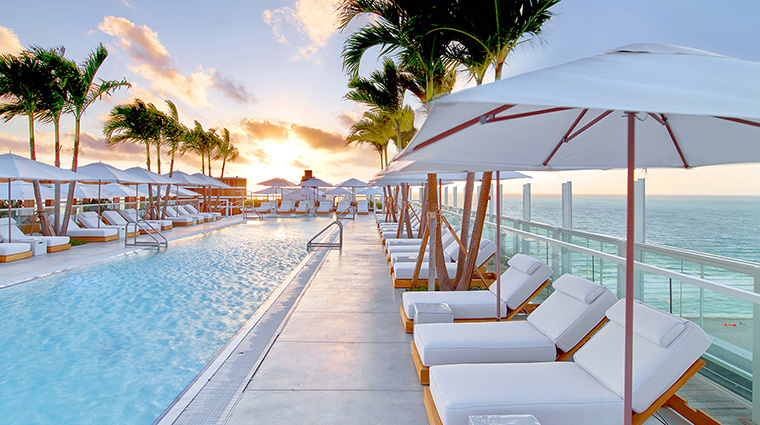 The Miami hotel brings together eco-conscious practices, elegant design and an unrivaled level of service. 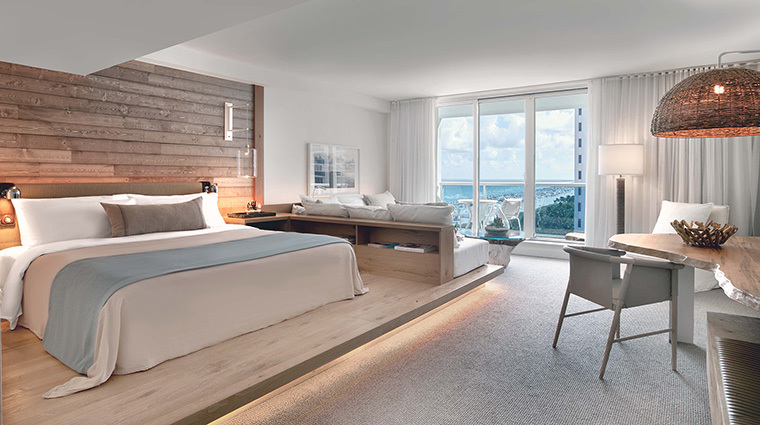 Occupying an entire city block on famed Collins Avenue, the luxury hotel sits on a plot of pristine beachfront overlooking the expansive Atlantic Ocean and offers views of Biscayne Bay and downtown Miami’s skyline. 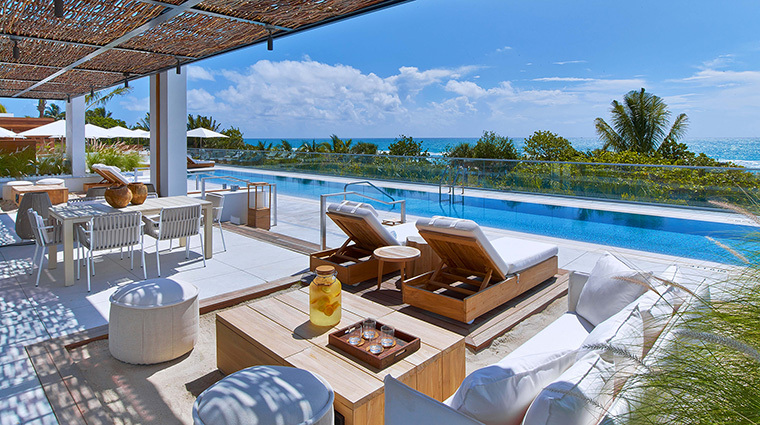 But an enviable location is far from the only glowing quality of this exquisite property. 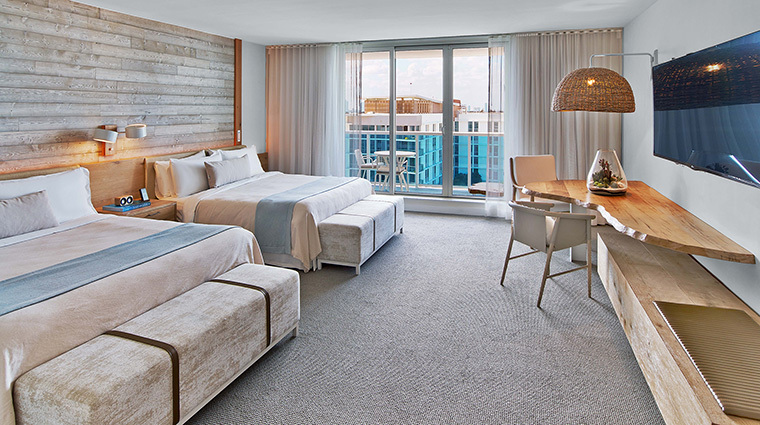 The Meyer Davis design of the hotel, restaurant and fitness center takes inspiration from the beach and surfers, incorporating reclaimed woods, natural poured and polished concrete floors and locally sourced materials like coral stone. 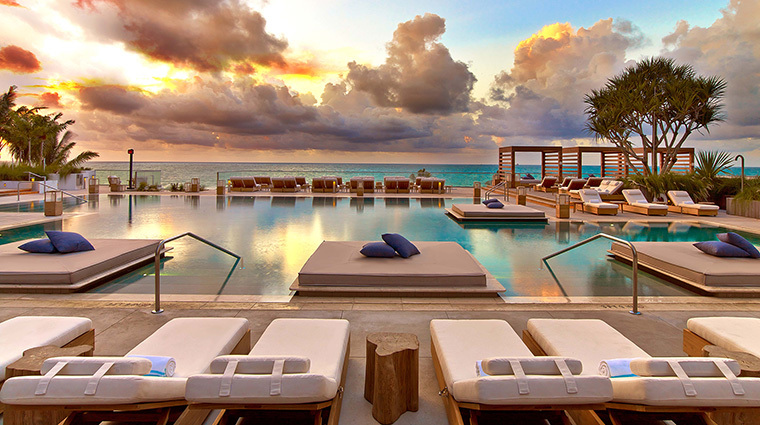 The sounds of the ocean set the tone for the soothing getaway as soon as you enter the trendy hotel. 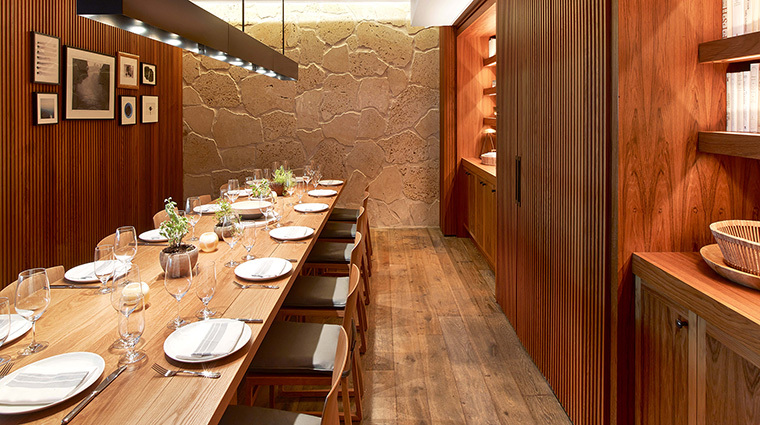 Brazilian architect and interior designer Debora Aguiar leads the spa and residential design, working in Napa-style, paned walk-in showers and rustic copper fixtures. 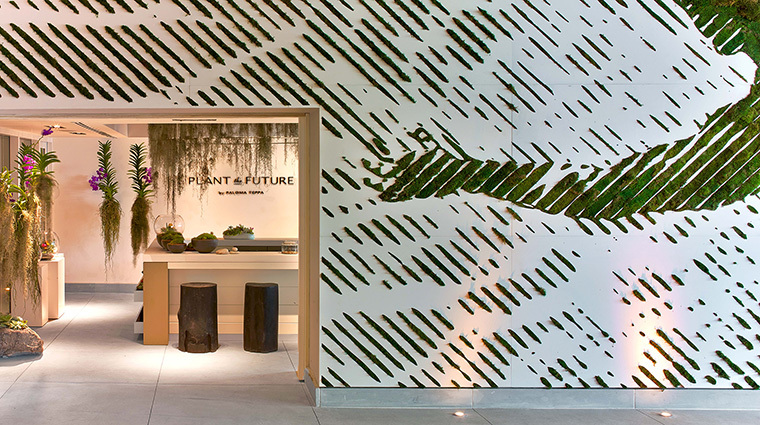 Nature-inspired design firm Plant the Future creates memorable green moments throughout the palatial space, like the living green walls on 1 Hotel’s façade and a grotto garden in the lobby. 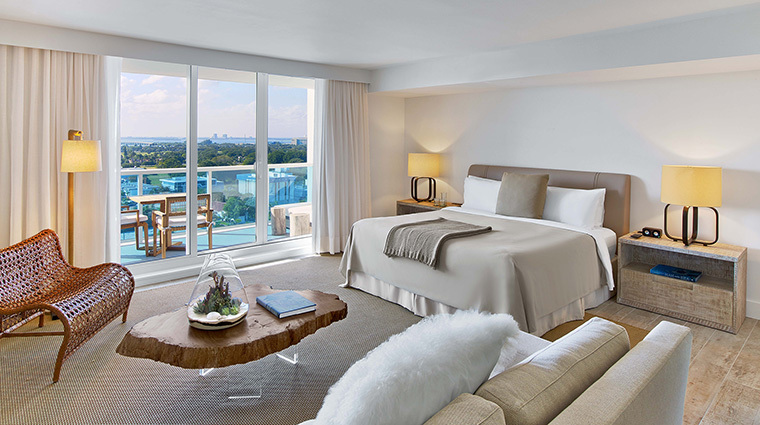 Make use of 1 Hotel’s app, “Field Guide,” to control all aspects of the room, from temperature to the television. 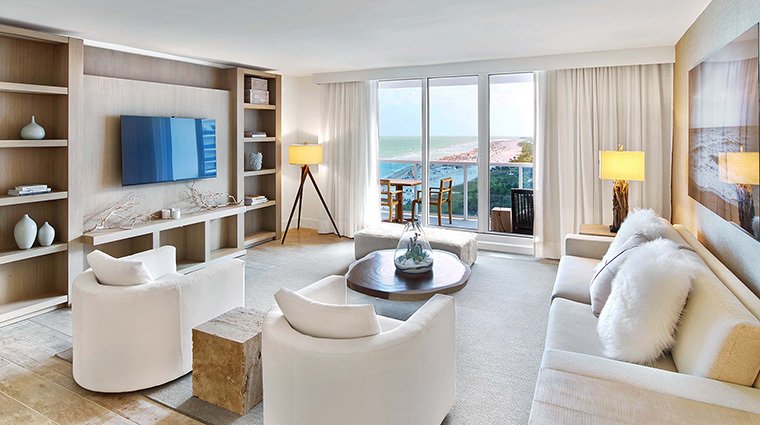 For the most extravagant hotel experience, reserve the Oceanfront Presidential Suite, which boasts a seven-room retreat that spans 3,600 square feet of indoor/outdoor space, complete with a balcony, pool table and state-of-the-art media room. 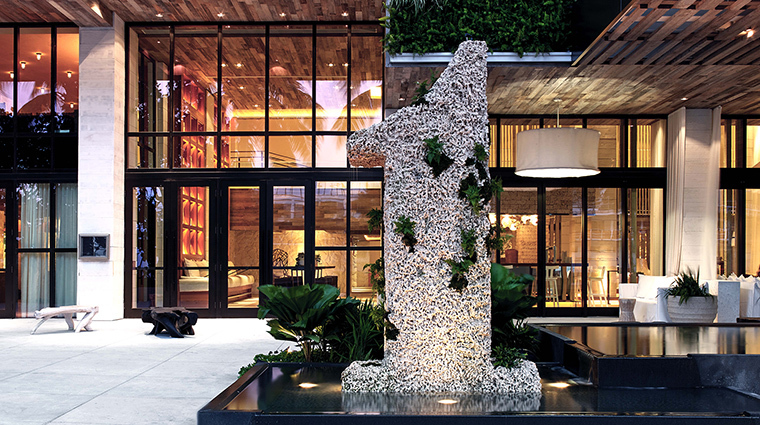 As a guest, you will have access to the 18,000-square-foot fitness and wellness center. The Spartan Gym is open 24/7, offering a range of classes like rooftop yoga and an impressive roster of equipment. A fleet of Tesla premium electric vehicles is available for complimentary rides within a three-mile radius. This family-friendly hotel has a Seedlings day camp for kids to enjoy during their stay. 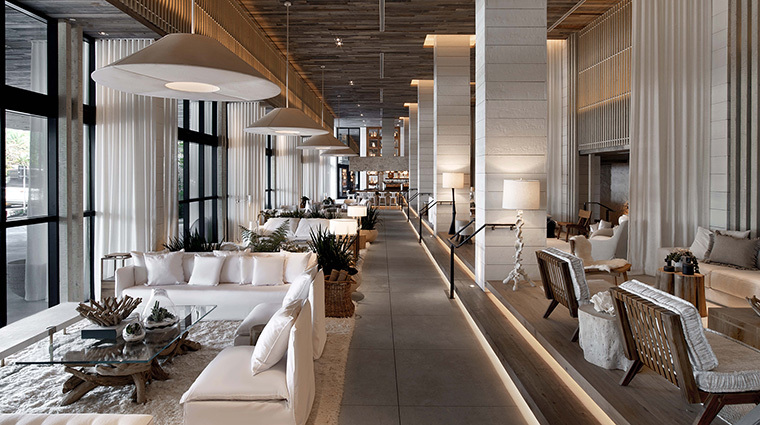 Rooms and public spaces are accented with artisan furnishings; bathrooms feature reclaimed Calcutta marble and hand-blown glass pendants. 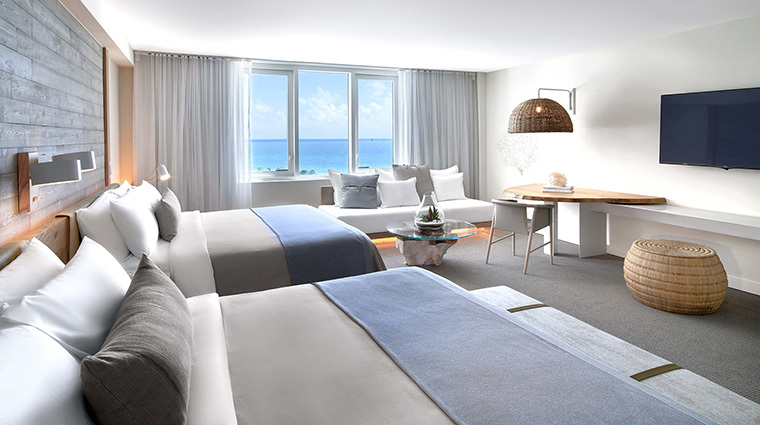 1 Hotel South Beach’s Mother Nature-approved guest rooms include 425 rooms, 168 suites and one Oceanfront Presidential Suite. 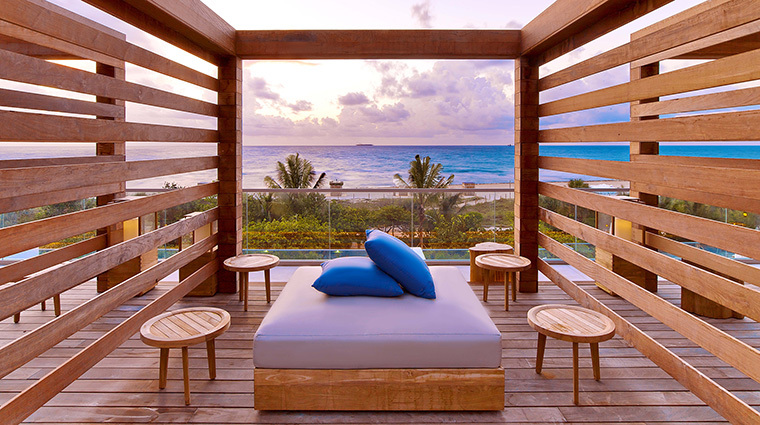 Plush beds have custom hemp-blend mattresses swathed in 100 percent organic cotton sheets. Towels, robes and linens are made of all-natural cotton knit. 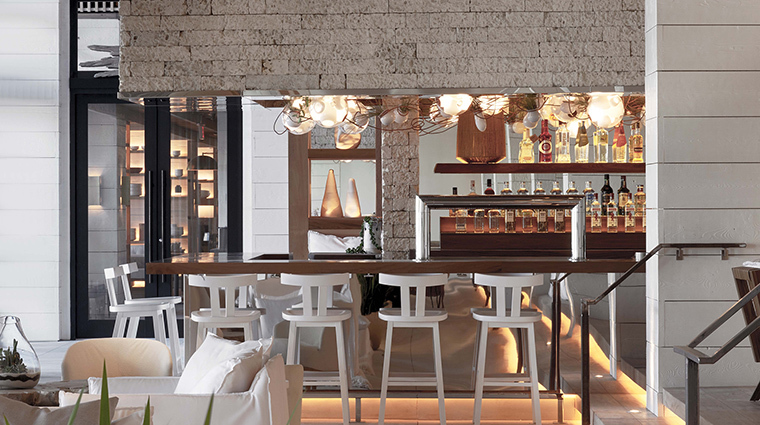 Glass terrariums bedeck every room and triple clear water filters in all taps, sinks and showers. 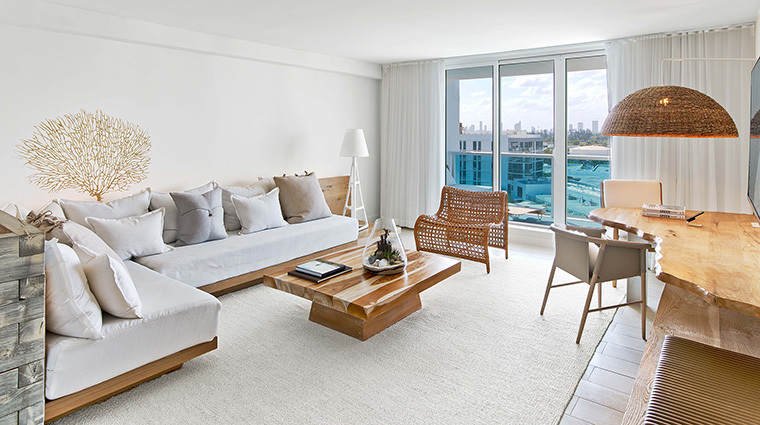 The Studio Suite boasts more than 700 square feet of splendor that comes in the form of a full kitchen and washer/dryers in unit. 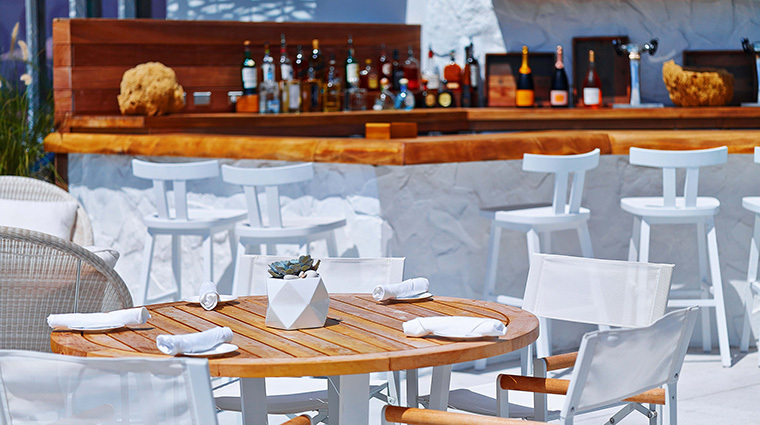 Staying true to its eco-friendly values, the South Beach hotel's dining is farm-stand fresh, Florida local. 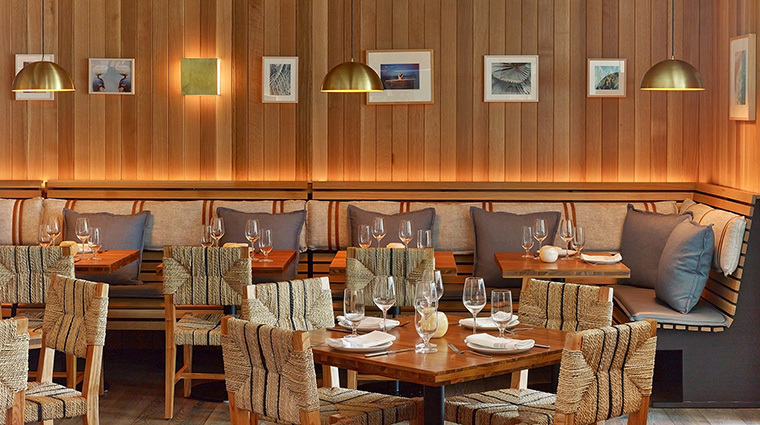 James Beard Award-winning chef Tom Colicchio is behind the hotel’s tour de dining force: the signature Beachcraft; the lobby lounge bar Tom on Collins; a poolside restaurant, The Sandbox; and room service. 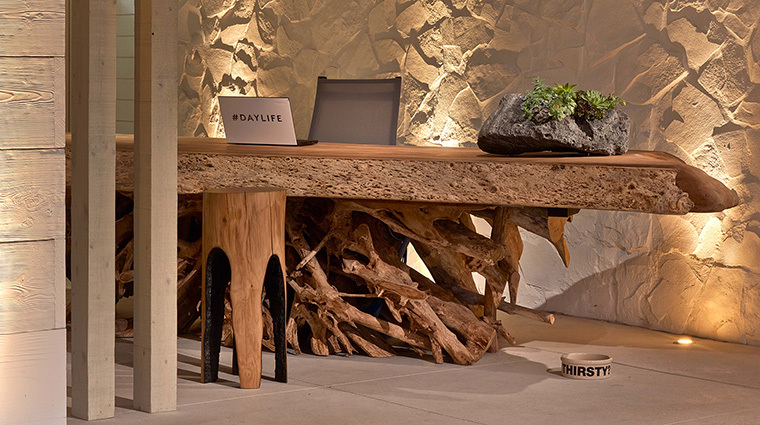 Additional onsite dining includes the Nativ Made grab-and-go concept and STK by the One Group. 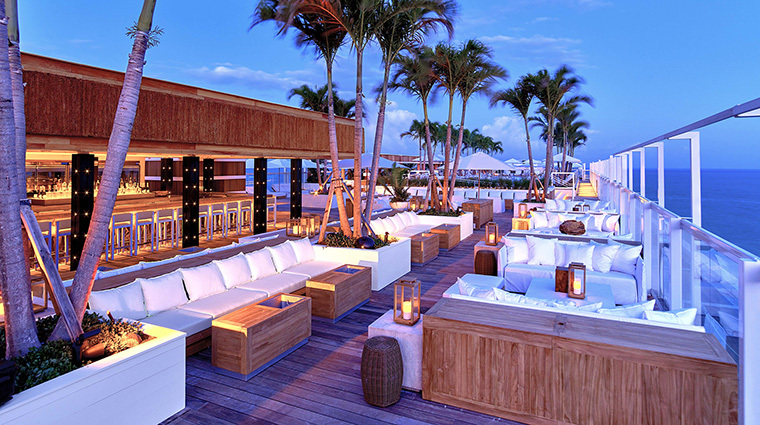 Most recently, 1 Hotel opened its newest restaurant experience, Watr at The 1 Rooftop, a place specializing in sushi and poke paired with handcrafted cocktails. Think Polynesia meets Japan with a dedicated cocktail-pairing connoisseur onsite to make sure everything works well together.